It’s no secret that Las Vegas was built by the mafia; in fact you could say that it was Bugsy Segal’s downfall. According to many sources, Meyer Lansky ordered Segal’s execution because Bugsy overspent mob money on the construction of his cherished Flamingo Hotel and Casino. And with such a colorful mob history it seems only fitting that the Mob Museum (www.themobmuseum.org) is located in Las Vegas, in the same building where one session of the Kefauver Committee Hearings on organized crime was held. This 1933 federal building was also the site where Tony Spilotro, Meyer Lansky and Lefty Rosenthal were tried. Today the second-floor courtroom includes the original furniture, including the bullet proof judge’s bench. But that’s only the tip of the iceberg at the Mob Museum. The self-guided tour begins with a mock line-up on the third floor, and continues as a timeline traces mob history from the immigrant families of the1800s, through prohibition when gangsters became bootleggers, and into present day mob activities. Giving equal time to the other side, there’s also a gallery about the G-men like Elliot Ness who pursued the gangsters. 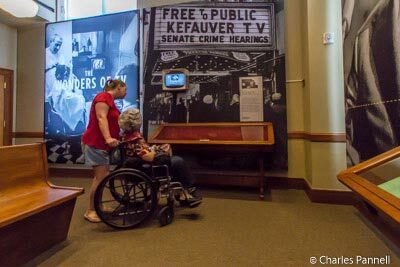 The second floor is devoted to the Kefauver Committee Hearings and other famous trials, while the first floor focuses on tools that were used to catch and prosecute the bad guys. Access is good throughout the museum, and although there are steps up to the front of the historic building, there is a wheelchair lift on the side. And in case of a mechanical failure, there’s also a portable ramp in the gift shop. Accessible family restrooms are located on the second and third floors; and there’s accessible parking in the nearby lot, with barrier-free access to the entrance. Get there early though, as the lot fills up by mid-afternoon. All in all the Mob Museum offers a very comprehensive look at organized crime, and it’s a great way to spend the afternoon in downtown Las Vegas.